House Democrats likely would support a stopgap government funding bill that maintains current spending levels, a senior lawmaker said Wednesday. 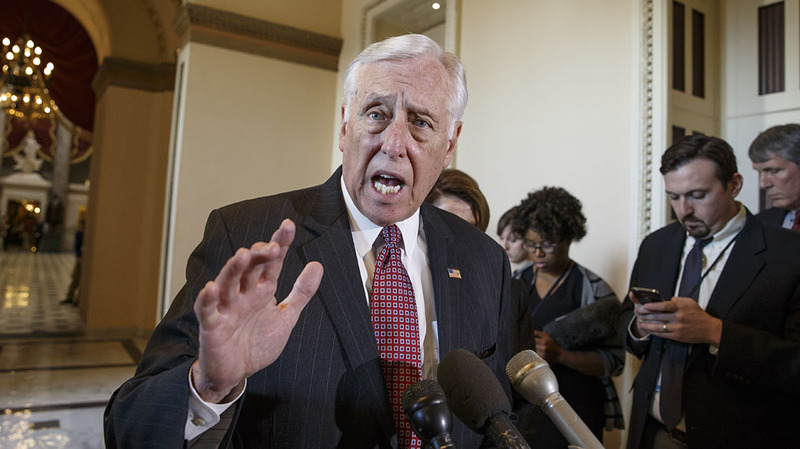 Minority Whip Steny Hoyer said his caucus would need to review the specifics of any Senate-passed measure, but he expects House Democrats will join Republican leaders to pass legislation to avert a government shutdown next week. But the Senate stopgap — expected to be passed in the next several days — would only stave off a shutdown for a few months, and senior aides say House Democrats will pressure Republicans to eliminate or reduce sequester spending cuts in any long-term funding bill. Given that the House GOP may need Democratic votes to pass any spending measure, the minority party is likely to have some leverage over any final agreement. Hoyer and Minority Leader Nancy Pelosi have said that Democrats are unlikely to support any long-term government funding measure that doesn’t increase budget caps for defense and domestic spending. The government will run out of money next Wednesday if the Senate and House cannot come together to pass a funding measure. But conservatives in both chambers want any continuing resolution to defund Planned Parenthood after the release of several sting videos showing alleged sales of fetal tissue by the nonprofit organization, which provides women’s health services. In the House, Boehner, an Ohio Republican, is facing a revolt from his right flank, with more than 40 lawmakers pledging not to vote for any bill that gives federal money to Planned Parenthood. Democrats, meanwhile, are insisting on a “clean” funding bill. There is still debate between Democrats and Republicans over the length of the first short-term stopgap bill. The White House and House Democrats want that funding measure to last only through November, but Senate Majority Leader Mitch McConnell introduced a bill this week that would extend operations to mid-December. Still, Hoyer was not entirely optimistic that lawmakers would be able to come together to avoid a shutdown. “Hopefully, common sense and reasonableness will prevail, but there is not a lot to base that hope on,” he said.